Inspections help clients to minimise risk by ensuring goods meet both industry and government regulations. Intertek is a leading agricultural inspection body, accredited by the International Federation of Inspection Agencies (IFIA). 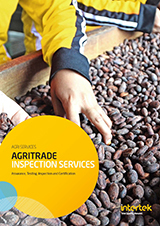 To protect our clients’ interests and reputations, we offer the full range of agricultural commodity inspection services. As a trusted third-party inspector, we identify issues at source before they become a problem; conduct pre-shipment inspections; and supervise cargo loading, discharging, weighing and screening. Our qualified inspectors are located at the world’s major ports, ready to provide services including tank and hold cleanliness, supervision, weighing, sampling and measuring. Understanding the condition of tanks and holds is vital to the safe shipping of your cargo. Contamination, infestation or humid could damage or destroy your cargo, while refusal to load due to suspected cleanliness issues can be costly. Our qualified inspectors check that holds and tanks are clean and dry, untainted by previous cargo and free from infestation. Samples are collected as per contract guidelines, and vary by type of commodity, your specific requirements and international standards. At every step we work to safeguard the quality of your samples. Once collected, we make sure that all samples are brought back to our laboratories within the required timeframe to guarantee representative and accurate results. Our pre-shipment inspection services can be tailored to suit your specific requirements, but all serve to make sure that your product is packed, loaded and shipped according to your specifications. Shipment risks can be mitigated through reliable, meticulous supervision during loading and unloading. Accurate, verified weighing at port terminals is essential for protecting the value of your cargo. Real-time information about the condition of your goods allows you to make immediate decisions about whether to accept or reject them, and enables you to release payments to producers or suppliers without delay. Our experts can be on site at warehouses, silos or port terminals to screen condition, and measure and grade goods, according to accepted standards.